Wishing you all a happy and successful year for 2018. I’m a bit late with this but have been preparing motivational documents for Natie who Geoff and I will be meeting on Tuesday 27 February 2018. Our main aim is to discuss the urgent need to attract talented boys to College by way of an Endowment Scheme. 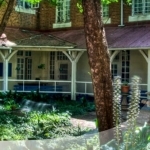 Potchefstroom Boys high was for over a 100 years been regarded as one of the most desirable boys’ schools in South Africa. It turned out well-educated, well rounded and successful young men. There is no doubt with all the Old Boys and School Projects and Activities to date, that there have been Successful Outcomes to the Repairing and Upgrading of School Facilities. Of importance these upgrades, have had a definite positive effect on staff and pupils alike. They have provided hope for the future, and that would not have been possible without the support from the Old Boys and cooperation by the School.When the Old Boys had accepted the challenge to upgrade School Facilities practical and ethical difficulties were immediately encountered.Whilst Natie Kirsh Sports Complex had a tremendous positive and uplifting effect on Staff and Pupils, we still had the important problem that the Hostels were not up to standard and certainly would not encourage mothers and fathers to send their boys to live in them. So the identified need for a marketing person would have a lack of credibility. Particularly when marketing the Hostels. We now are able to show that Hostels are very acceptable, from an aesthetic point of view, as are the other facilities. Either as complete or in the process of being upgraded by funds obtained from the Old Boys and from the use of the new Upgrades and Rentals. So obtained. The “Adopt a Classroom” Project has shown a growing understanding and interest by Old Boys and the way they are supporting such a Scheme. However to ensure the rentals and fund earning capacity of the hostels is maximized. We will be converting larger dormitories into two bed cubicles, initially in Buxton. This will encourage use by people needing accommodation, such as, any visitors to the school, visiting sport teams, special groups such as the deaf boys who spent a week at the school in 2017. There will be professional people male and female who need accommodation when marking papers or other needs, meetings and such like. The major achievement would be to become a “registered School’ for the marking of matric exam papers. This could produce an income of between R 200 000 – R 500 000 per year. All upgrades must be seen as being able to provide Income and so be self-sustained. ‘That hit me. Really hard’ said Abdul. ‘I take it that it has paid off for you,’ I said. Start becoming an eagle today … one small step every week. Next week… And next…And…. For College, that means Governing Body, Staff, Parents and Pupils. With Old Boys providing support to ensure this with positive actions with above groups as well as raising funds as they have been doing in very positive ways. Of great importance and part of a progressive plan it has now become very urgent that funds need to be raised to set up a Viable Endowment Type Scheme as a means of attracting talented staff and pupils to the school. At the same time being able to keep talented pupils and staff, where we have lost several in recent years. To make this now an actuality, discussions have been held with Natie and the School. The school has responded by providing a comprehensive document to provide rules for a Scholarship and Bursary Fund Policy. How to achieve a wider spectrum of Boys from different localities and maintain the boarder population. The school has also developed a very important document to be completed by applicants. It is a very extensive questionnaire which will identify problems such as a history of non-payment. Over 40% in the beginning, as well as other problems. Just accepting local pupils with no culture of learning and paying was resulting in a very negative effect on academic standards, discipline and funding. Today such pupils can be, identified and advised the school is full. This sounds harsh but for a few years groups of local boys did great damage to College’s image, discipline and funds. School fees at College are certainly among the lowest for Schools of similar Stature. This has caused an imbalance with regard to higher hostel fees a particularly important area, we need to possibly adjust from an affordability point of view. Another negative problem caused by the Education Department rules was being compelled to accept nearest local boys. This causing a rapid reduction of boys for the hostels. Not only is this financially negative but it has always been accepted that, boarders were the glue that held boys of different localities heritage and language together, thereby producing very special open minded College Boys. As a result of hostels being demographically fully inclusive, since 1994, a vital South African dimension has been added to College life with very good and rewarding results. It is hoped that this short explanation of Education Department problems has shown the difficulties experienced and had to be legally managed, College has done well. With a very satisfying and successful 2017 where the School and Old Boys were able to manage more than expected with the upgrade of facilities we now have a great need for an Endowment Scheme, concentrating on Bursaries and Scholarship requirements to be able to obtain and keep Staff and Boys of talent. Of importance the School has developed a Scholarship and Bursary Policy. I will be providing all this information to Natie and believe it would be informative and impressing for you. Turning 90 did one thing for me, it brought such a flood of memories I think I had a ‘BRAIN STORM” trying to manage it all. The invitation to celebrate the School’s and my Birthday was amazing. So as not to lose any school time at 11: 30 promptly all the school boys and staff assembled on a stand next to the Thor Gevers “A” field. The A field was decorated with colourful Indian Style tents and each boy was given a large slice of birthday cake. Many quickly rushed off to hide their cake in their locker for later consumption. After the Headmaster had spoken the prefects led the boys in the Warcry, School Song and another song in their language, which I guessed might have gone like this. “He is an Old Man and we will be happy to carry him to his car afterwards”. All these wonderful moments were followed by refreshments in The Ackermann. Certainly a memorable experience. Tracy and I drove back home full of wonderful emotions and that everything accomplished was worth it. My thanks go to Basil Kletz because I have been busy with Natie’s Quotes and getting information who has written a ‘NEWSY’ letter that I am sure will be interesting to you all. GET TOGETHER/GATHERING BRUNCH SATURDAY 10th MARCH – ARRIVE ANYTIME from 10 am (morning) onwards – they open at ten. VENUE- KEG AND BEAGLE – behind Woolworths, overlooking the highway. LINKSFIELD OFF RAMP – Secure parking and easy access. All old boys/girls of Potch Boy`s High, Girls High, Convent and friends are once again most welcome to join the Class of 1965 in a trip down memory lane to see old friends and to make new ones. The food at the Keg is excellent, to go with caring service and an assortment of beverages. During 2017 some dear friends passed on and we will remember them by way of a short memorial service. From the class of 1965 Trevor McDonald (day boy 1961-65) who went on to teach at College and his sister in law Jenny McDonald (Convent), married to Ashley, are two that I can think of. Stan Sandler (Dayboy 1960-64) tragically left us in January. Although living in Sydney, Australia, Stan had attended gatherings organized to coincide with his visits to Johannesburg. An accountant by profession he enjoyed walking, birding, photography and friends.BUTCH BOSCH (GRANTON 1961-65) and his wife GWEN have recently moved up to Jo `burg from Howick and will be joining us for the brunch. Butch is looking forward to reconnecting with old school mates again. I was there sitting in the stands when Boys High last hosted the event. The atmosphere was electric, bringing back memories of a time all those years ago when we sat on the sidelines cheering our team on. Do you ever wonder who the OLDEST OLD BOY is and whether any have made it to 100, or maybe a HAG`s OLD GIRL? He may not be the oldest, may not even be the first to 100 but on the 21st DECEMBER 2017 THOMAS PARSLEY TAYLOR fondly known as JACK, attained the magical age of 100 years old. Born in RUSTENBURG on the 21st DECEMBER 1917 to THOMAS PARSLEY TAYLOR SNR and EMILY (McDONALD) TAYLOR Jack was the third eldest of six children. His dad known as T.P. practiced law in Rustenburg from 1910-33. He also served a term as Mayor. 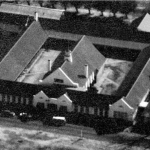 The TAYLORS moved to Swartruggens in 1933 at the time of the diamond rush that took place there. Then in 1941 they relocated to LICHTENBURG where T.P. started a law practice.JACK Taylor attended Boys` High from 1933-34, (standard nine and ten,) matriculating with a first class pass at the age of 16. A boarder in Buxton he had a natural gift for ball games. He played first team cricket and rugby for the school in his Matric year and was awarded his colours for both sports that year. The school magazine, The Mooi , in analyzing the 1st XV (Rugby) characters, their strengths and weaknesses had this to say about the 1934 fly half T. P. Taylor – young light find of the season. Makes delightful openings, fine swerve, safe hands, sells a good dummy, passing well timed, defense reliable. He had taken over the fly half position vacated by his older brother WILLIAM TWENTYMAN PARSLEY TAYLOR (known as BILLY) BUXTON 1931-33. 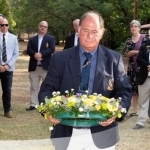 BILLY, a prefect in matric had played for the first XI and first XV, receiving his colours for both in 1932 and 33 and rugby vice-captain in his matric year. He proved to be a good leader in the absence of the rugby captain. Billy in later years represented Northern Transvaal at Rugby. Their younger brother, RUPERT PARSLEY McDONALD TAYLOR, also represented the first cricket and rugby sides. A Buxtonite he was awarded his 1st XV and 1st XI colours in 1941 and 42. The school magazine notes that our brilliant fly half was forever a thorn in the side of our opponents, through whose ranks he persisted in finding a slippery gap. Sadly RUPERT passed away at the age of 93 in August 2017 (last year). BILLY died on the 5th June 1976, aged 60. Jack and Billy both became well respected lawyers, Billy in Pretoria, Jack in Lichtenburg where he took over his father`s practice. During the Second World War after training at the military College at Voortrekker Hoogte as a Second Lieutenant Jack was sent to join the 1st SA infantry Division, Second Brigade Field Forces Battalion entrenched at El Alamein (part of the 8th ARMY). 23rd October 1942- In charge of a mortar platoon of 24 men they fought the German and Italian forces for 21 days. The battle of El Alamein and ensuing battles have gone down in history as the turning point of the Second World War. The cost was great to Jack`s Battalion. Of 400 officers and men 80 were killed and 240 wounded. The 1st SA Infantry Division was withdrawn and ordered to return to SA on leave. Jack came home to find that his dad was dying of cancer and wanted him to take over his law firm. He applied and received a compassionate discharge from the army. During his time up North Jack had been awarded two Medals, the AFRICA SERVICE MEDAL and the AFRICAN STAR with 8th Army Clasp.LICHTENBURG became home. He continued to practice law, obtained a Bachelor of Commerce from UNISA, started commercial mixed farming and took a special interest in his Bonsmara beef herd. Jack married HAZEL VERA NORRIS in DURBAN on the 4th December 1948. They had four children and involved themselves in all aspects of community life in the Western Transvaal which included Moths, Cerebral Palsy, Santa, Old age Home, taking it all in their stride. Jack and Hazel were active members of the St. Barnabus Anglican Church to which Jack still belongs to today. They supported local schools with prizes for academics and sport. In those days they both enjoyed playing golf. Sadly Hazel passed away in 1985. Jack continued to work until age 85, keeping himself fit by walking. After retiring he carried on farming in the district until age 96 when he had a bad fall which required major surgery. Failing eyesight, hearing difficulties caught up. Today he lives near his son Tom at Woodside Village for the Aged in Cape Town. This will take place on the 10th November (Saturday) and following the success of last year (2017) this is one dinner NOT to be missed. LAST YEARS DINNER 2017-Thanks to the TEACHERS (Educators), ADMIN staff and school LEADERSHIP the hall was set up as never before. Classes celebrating milestones had class and sport pictures displayed on boards, bashers, old books etc. decorating the tables and respective publications of a record of those classes available for purchase. Malcolm Cowan`s original painting of the front of the school was auctioned off, a number of this sought-after print were then eagerly bought. Martin Jonas (jnr- I think) performed the auction and for over half an hour had us in hysterics as he related story after story at times touching on the auction but never going through with it. When he actually got the auction going he would then interrupt with a new story before restarting at a different figure. What a night, what a dinner. A most memorable evening enjoyed by all who attended. THURSDAY 8th November- Those arriving from out of town are most welcome to join our local POTCHEFSTROOM old boys from College, old girls from both Hags and Convent, teachers and friends for a get-together at BEEF BOYS. Turn up any time from four thirty pm onwards. (BANNER will BE DISPLAYED). Last year we had 25 people attend which included teachers from both schools. ACCOMMODATION – As there are no learners staying in BUXTON this year the hostel is once again available to those of us attending the dinner. The hub of activity last year staying in the hostel proved to be a winner. Magnificent, well-kept gardens with the LAPA the focal point meant very little time was spent in our allocated rooms. Being a Miltonite all alone in Buxton on Thursday night proved to be quite strange, 15 of the thirty who attended the braai Friday evening stayed over, 45 people the Saturday evening following the dinner which carried on into the early hours of Sunday morning. So successful was the dinner (record number of over 150 attended) that those staying over in Buxton and friends carried on with the festivities, six of whom spent the entire night under the lapa. Coffee was served by Anita and Alec Paiva at 7 that morning. ALEC (dayboy 1963-67) AND ANITA PAIVA stay in the house masters house. After ten years in Granton they moved over to Buxton at the beginning of 2017 and were instrumental in overseeing the renovations in Buxton, the decorating of the hostel and the work done in redoing the garden surrounding the hostel. They certainly spoilt us by supplying coffee, tea, rusks, bread baked by Anita, this at regular times during our stay, arranged the BRAAI FRIDAY evening that ALEC coordinated with Anita – he the fires, meat (braai packs) that were great value, she the salads, bread rolls etc. As everyone who attended was responsible for arranging their own refreshments Gary Watson kindly purchased extra for those who might have forgotten to bring. The costs of reserving a room are the same as last year with everything going to school funds. Last year the hostel was set up so that those attending with their wives/girlfriends/partners would have privacy as also old girls from Hags, convent etc. There is space for approximately 110 in the hostel. GOLF at the POTCH COUNTRY CLUB. LAWN BOWLS same venue. Spare bowls will be available for those wishing to enjoy a FUN morning out on the greens and should enough people turn up an inter house/school/teachers challenge can take place. No previous experience needed. Our OLD BOYS SOCIETY`S PRESIDENT WALLY HOPTON (MILTON 1940-45) celebrated his 90th birthday on the 19th January. Congratulations, happy birthday, Wally. May you enjoy many more years of good health. Thank you for caring as you do for our school and for those who have passed through it. Wally was HEAD PREFECT of the school and Milton in his Matric year. He shared the senior/Open VICTOR LUDORUM with BV BADENHORST that year after doing the sprint double by winning both the 100 yards and 220 yards in the inter-house athletic meeting. He came 2nd in the 440 yards. The “ADOPT A CLASSROOM PROJECT” is something that Wally is passionate about. CLASS YEARS have to date provided/raised funds for eleven classrooms to be renovated and upgraded. Two of the science labs have also been redone. Funding is still needed for nineteen classrooms, the biology lab and lastly the library/museum. On your next visit to Boys High spend time looking around the classrooms and hostels. I am proud of what I see today, no doubt you will be too. On the SUNDAY a special FREEDOM PARK RUN was held at the Trim Park in Potch with Paul and Joanne participating. Some of us joined them in running/walking the 5 kilometers. Their mission is to make the world a healthier and happier place. It takes place every Saturday morning, a free timed run for anyone who would like to attend with volunteers giving up their time to help along the route, with timing etc. Find a park run near you, join in, have fun meeting new people, be rewarded (t shirt) for reaching 50, 100 etc. milestone runs/walks, a life changing activity where finishing time is not important just participating is. A MEMORIAL WALL was built a few years ago in the tranquil, peaceful setting of the tree lined lawn behind the old TUCKSHOP, this to the right of Granton if facing the entrance of the hostel. We are in the process of getting quotes for aluminum plaques to be made and attached to the bricks with the names of our class friends who have passed on, their years at school and hostel. We envisage a ceremony at the wall an hour before the Armistice Service, the reading of the names by a minister and the laying of wreaths for each group/year that participates. PLAY – the production that year was JULIUS CAESAR. Willie took the part of POPILIUS LENA in the play. At the time of all SHAKESPSPEARE`S plays the one considered most suitable for a boys’ production was Julius Caesar. It was also thought that there should be no comparison made between a production of Shakespeare by a school and by experienced actors and this particular production at Boys High excelled. After having shown no interest or apparent talent for athletics at Boys High W J WALTERS took part in the SUMMER OLYMPIC trials in 1928. He was unfortunate not to be selected for the 440 yards after having made a good showing. The next year 1929, against the Achilles in Johannesburg he broke the SOUTH AFRICAN 440 yards record in a time of 48.2/5 seconds. He also won the 220 yards. 1930- Selected for the EMPIRE GAMES held in HAMILTON in the Province of ONTARIO, CANADA. These were the first BRITISH EMPIRE GAMES ever held. Since 1978 the games have been known as the COMMONWEALTH GAMES. His results- 440 yards silver medal (2nd). 200yds Bronze medal (third). With the South African Relay team he won Bronze in the 4×100 yards as also the 4×440 yards event. WILLIE WALTER`S RESULTS – 400 meters – finished 4th, (48.2 seconds). The winner broke the world record with a time of 46.26 seconds in the fastest race yet run over that distance. At the time Willie was suffering with a thigh injury. In the 200 meters he finished 6th. He was described as a long striding runner. That same year, in September, he appeared at the school inter-house athletics in his springbok colours and was loudly applauded. Running in the old boy’s race he strained a tendon in his left leg. Failure to go through with his regular warm up procedure maybe? Until his retirement from athletics he continued to win National Titles but never again represented South Africa. VAN RENSBURG entered the school in FEBRUARY 1916. He always appeared happy and content whether at work or at play. He won the reputation and achieved the distinction that all schoolboys should aspire to. He possessed a sunny and generous nature, looked life straight in the face, played his part manfully and his memory will be cherished by all who came in contact with him. A DAY BOY school Prefect in his Matric year he played RUGBY for the first team in 1919, 1920 and 1921. A talented player he excelled on the wing. When the captain J. HIGGS, left in July 1920 Jansen Van Rensburg was appointed captain. Reappointed to lead the team in Matric he died early in the season (29th APRIL) as a result of an unfortunate accident on the rugby field. He was subsequently carried into CALDER which was then known as the Sanatorium. 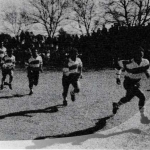 Whether he died on the rugby field or the Sanatorium is irrelevant, but so began the legend of the Calder Ghost so aptly described for the Centenary book of the Potchefstroom Old Boys Society in 2011 by McGill Alexander (Barnard, Milton 1960-65). He was laid to rest in the cemetery at JACHTFONTEIN which is a settlement consisting of a shop, small church, (inaugurated in 1891), cemetery and lots of history. Number of sinkholes and a Great Wall built probably 200 years ago before the advent of fencing. Situated just off the road from Vereeniging to Randfontein just before you get to Western Area. Or was ALBERT ERXLEBEN, pictured in the Rugby first team picture of 1913 the Calder ghost. Sitting front left he appears to have been placed/positioned there so as to have him in the picture. More about Albert in Limited Clan Chronicle 19 as he was very much alive in the 1914 Rugby picture. The School is in the process of updating the boards. Information is required re those old boys who have represented South Africa or any other country in sport, or may have excelled by winning a national/international title but not subsequently been selected to represent their country. 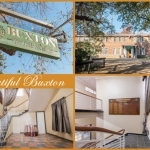 BUXTON HOUSE – Bed and Breakfast R 250 per person. (Same as 2017) All money goes into school funds. My choice for the week end. Good value, rooms large, clean and neat. Large spacious rooms, two double beds in each. Single- R 860 per night B&B. 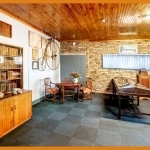 Double- R1260 per night B&B. For those wishing to stay at the Dam for old time`s sake.